Let's get you up and running with sending email automations from Jilt. Click the Automations link in the left menu. Note: If you have multiple stores in Jilt, you will need to go into your desired store first. We'll next click the +New Campaign button. On the following screen, you will be asked to choose the type of automation you'd like to run, along with the automation's name. 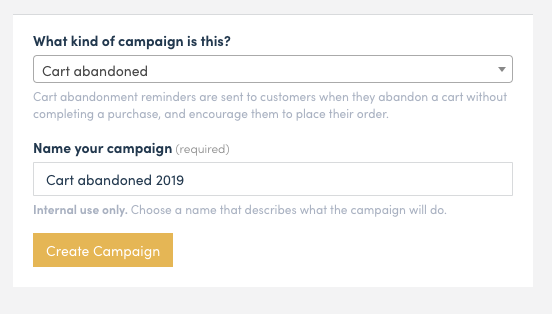 Click the Create Campaign button once you've made your selection. Your automation will automatically include default emails, depending on the type of automation you've created. 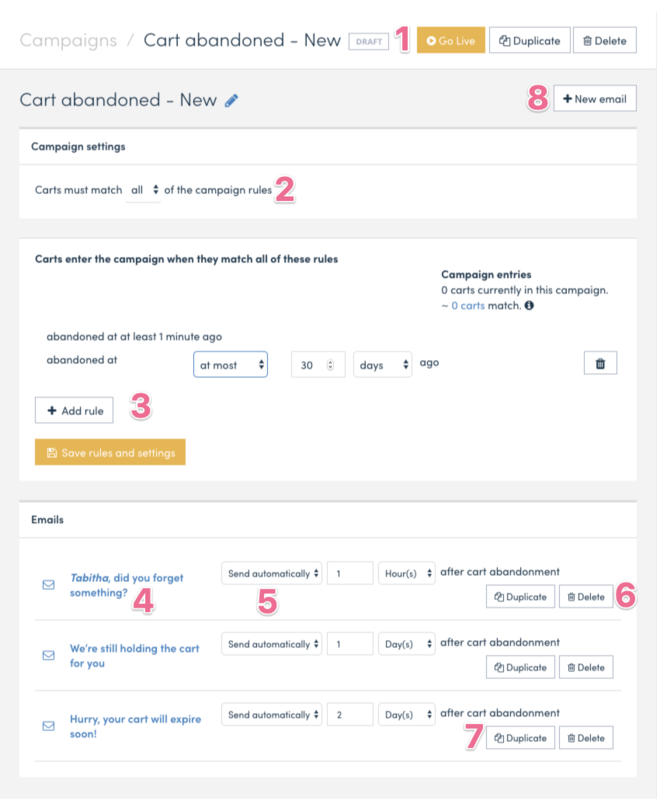 For example, a cart abandoned automation automatically contains 3 emails based on the most effective best practices for recovery. 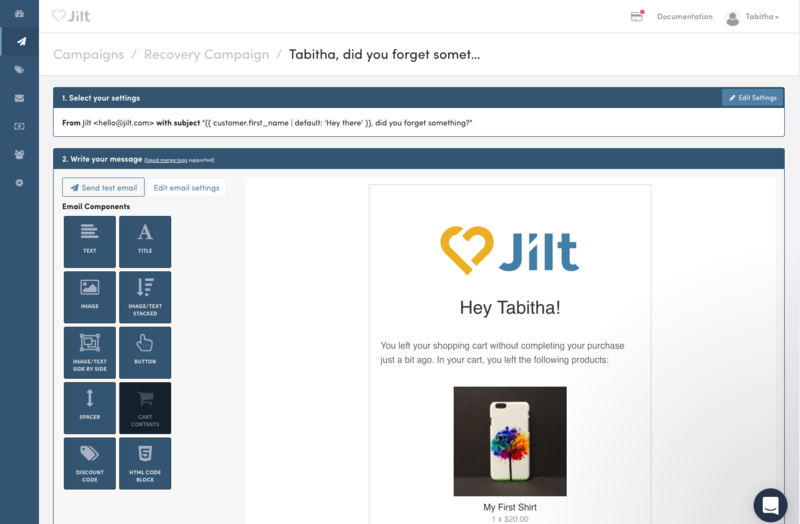 Remember: You must turn your automation "on" before Jilt will start sending recovery emails. While editing a new or existing recovery email, you'll be able to both edit the email settings and content. Each email has a few settings you can configure. From name: The "From" name for the email; this is what customers will see as the sender when they receive a recovery email. From email: The "From" email address for the email; this is what customers will see as the sending email when they receive a recovery email. BCC email: (Optional) an email address to CC on these emails if desired. The content editor lets you insert content, add personalization, or import HTML (for advanced usage). Drag-and-drop an Email Component from the left-side menu, such as a Text Block or Image Block, to add it to the email. The final section of the email editor gives you control over when the email goes out. Sending behavior: Whether to send the email automatically or not; not sending automatically basically allows you to keep this email as a "draft" until you're ready to start sending it. Delay time: How long after the cart has been abandoned to wait before this email is sent. A cart isn't considered "abandoned" until the cart been idle for at least 15 minutes (no changes to items in the cart), and you must wait at least 1 minute after this period before sending a recovery email. We recommend a delay time of an hour or less on your first email. Once you're pleased with your automation settings, make sure to activate the automation to start sending emails. From your Automations screen, click the Go Live button next to the automation you'd like to start using.